If you want to transfer data in the delta process, the process must be initialized in the first data request. In this process, the selection conditions for connecting delta uploads are set and its complete data set is loaded into BW from the R/3 System.To do this, you must select the check box Initialize delta process for the Info Package under the update parameters of the Scheduler. 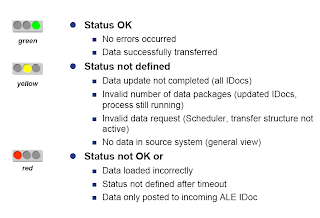 When the initialization of the delta update for an Info Source is started, all the data from the associated info structure in the OLTP System is uploaded to BW and fills the specified Info Cubes specified in the Info Source.Make sure that update of the info structure in the OLTP System is inactive. This prerequisite is only necessary for the initialization run.If one or more selective initialization runs (selection according to plant, for example) is carried out, all the selection conditions must be entered in the selection screen for the subsequent delta upload. Status 0: data request received by source system, source system starts to select data. 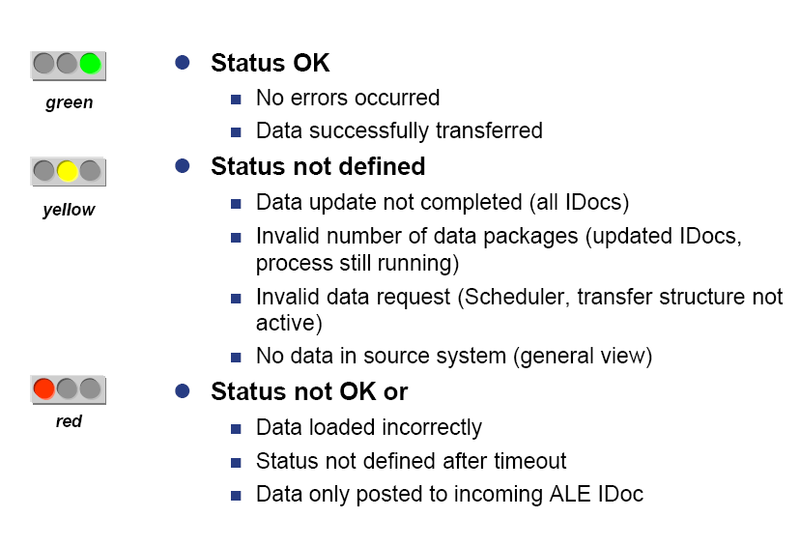 Status 1: this status indicates a data IDoc that contains further data processing information. Status 5: an error has occurred in the source system. Status 9: data selection in the OLTP System has been successfully completed. The traffic light changes color depending on the context.Note that a red light does not necessarily mean that an error has occurred. Generally speaking, the volume of transaction data is considerably higher.Delta update mechanisms that restrict the volume of data to within realistic limits, therefore, are required to implement a performance-oriented, periodical data transfer strategy. Therefore, when sales figures are updated every week in the Business Information Warehouse, only the sales document information that has been added or changed in the last week should be extracted. In this case, you have to activate the 'Delta Update' check box for the Info Package in the updating parameters of the Scheduler. 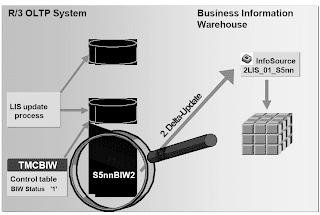 When you start the delta update process from the OLTP to the BW, the tables S5nnnBIW1 and S5nnBIW2 are used.The info structure in the OLTP is active. 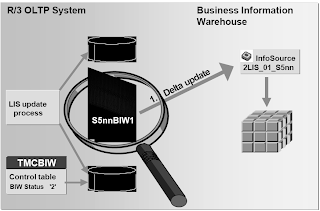 The data from S5nnBIW1 is transferred to the BW for the first delta update.While the first delta update to the BW is being carried out, the LIS update process updates the LIS info structure in the OLTP system as well as the table S5nnBIW2, which is then used for the second delta update request to the BW. At the start of each delta update request, the system switches between the S5nnBIW1 and S5nnBIW2 tables to prevent inconsistencies while the data is being uploaded to BW. (The 'BIW status' flag in the 'TMCBIW' table on the OLTP system is automatically changed from 1 (for table S5nnBIW1) to 2 (for table S5nnBIW2) during the delta update to BW. )The data in a delta table remains in the table until the next delta upload to ensure that the data can be reloaded up to that point.